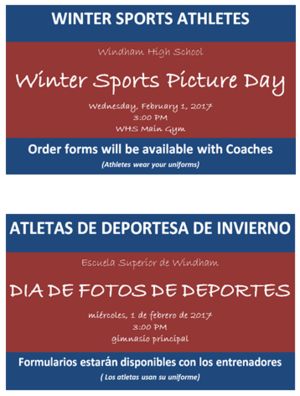 Winter Athletes will be taking team pictures on Wednesday, February 1, 2017 at 3:00 PM inside the main gym. Winter Athletes will be taking team pictures on Wednesday, February 1, 2017 at 3:00 PM inside the main gym. Please wear your uniforms.